Americans on a mind-boggling incarceration road trip. Day One. Pictures of European prisons can be shocking, at least here in the United States. After all, eight of Buzzfeed’s “14 Prisons That Will Make You Question What You Think About Serving Time” were in Europe, and last fall, Business Insider told us, “An American Warden Visited A Norwegian Prison, And He Couldn't Believe What He Saw.” Fed a steady diet of The Shawshank Redemption and Orange is the New Black, American readers know their own prisons are bleak places. So these images—of well-stocked kitchens, pottery studios, and cells that look like college dorm rooms—are a reminder of how starkly different correctional systems can be. The Vera Institute of Justice, a New York-based nonprofit that works with government agencies to improve courts, prisons, and other criminal justice institutions, has been trying for the last few years to show Americans that the two continents may not be as wildly incompatible as such headlines might suggest. 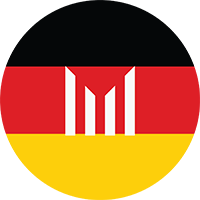 This week, Vera and the John Jay College of Criminal Justice are taking a group of prison officials, prosecutors, researchers, and activists from the U.S. to tour German prisons. The International Sentencing and Corrections Exchange, as this tour is being called, includes the heads of the prison systems for New Mexico, Washington, Tennessee, and Connecticut, several district attorneys, and Connecticut Governor Dannel P. Malloy. I’m here with them. Over the next several days, I’ll be keeping a tour diary for The Marshall Project and VICE, watching as they visit a series of facilities in Berlin and Mecklenburg-Western Pomerania, along the northern coast, and hear presentations on how Germany handles sentencing, drug addiction, officer training, juveniles, high-risk prisoners, and probation. Vedan Anthony-North, a program analyst at The International Sentencing and Corrections Exchange, at Heidering Prison on Monday in Brandenburg, Germany. The trip comes amidst an ongoing reevaluation in the U.S. on both the right and left about whether the tough-on-crime policies that proliferated in the 1970s — from lengthened sentences to increased use of solitary confinement to the prosecution of teenagers in adult courts — have actually made the public safer. (That reappraisal has been promoted by two conservatives who on this trip: Marc Levin, a Marshall Project advisory board member and policy director of the Right on Crime movement, and Vikrant Reddy, a research fellow at the Charles Koch Institute). The state officials picked for this trip have shown an interest in reform. Malloy, the governor of Connecticut, and the state’s corrections chief, Scott Semple, have pushed to repeal mandatory sentences and improve programs to help ex-prisoners find jobs, terming this broader initiative the “Second-Chance Society.” Gregg Marcantel, the corrections secretary of New Mexico, has pushed to reduce usage of solitary confinement. John Chisholm, the district attorney of Milwaukee County, has tried to address high incarceration rates of African-Americans. The Vera Institute has chosen these leaders in hopes that they’ll take the European lessons seriously, and that they have the clout and credibility to enact change once they return home. Beyond policy, comparing American and German prisons will surely unearth some deeper undercurrents in the histories of both societies. Just as no study of American prisons is complete without looking at the history of race relations all the way back to slavery, German incarceration exists in the shadow of the 1940s and that decade’s unspeakable combination of prison, factory, and slaughterhouse. “I’m interested in how contemporary German officials imagine the past in relation to their current practices,” said Khalil Gibran Muhammad, who directs the Schomburg Center for Research in Black Culture at the New York Public Library and will be on the trip. He has argued in the past that American public discourse is far more willing to examine the horrors of the Holocaust than to reckon with the legacy of slavery. Jeff Rosen, the district attorney of Santa Clara, California, is staying an extra two days in Germany to visit the remains of the Bergen-Belsen concentration camp, where his father was rounded up as a five-year-old and narrowly escaped death, even as much of his family did not. A previous version of this story misstated the location of a previous Vera prison tour.